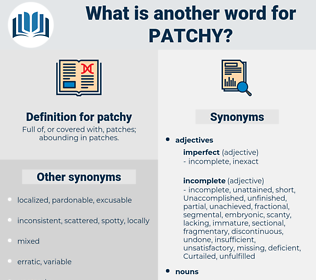 What is another word for patchy? 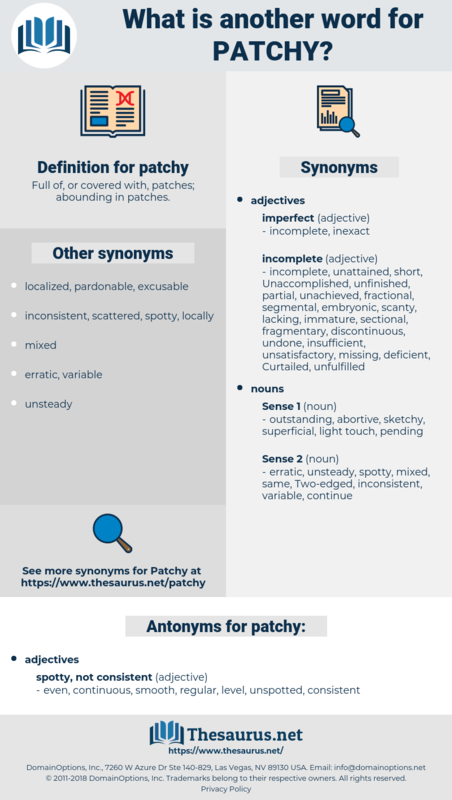 Full of, or covered with, patches; abounding in patches. irregular, scattered, unequal, sporadic, inconsistent, inequitable, disparate, lopsided, incoherent, ragged, inadequate, mixed, partial, asymmetrical, insufficient, dispersed. fragmented, fragmentary, piecemeal, sparse, incomplete, uneven, erratic, heterogeneous, spotty, deficient. even, continuous, smooth, regular, level, unspotted, consistent. In color he was superior, though somewhat violent at times, and in brush - work he was often labored and patchy. A patchy perspiration breaks out about the body and quarters, and the tail is outstretched and quivering.